I’ve now been working in the industry and for Luxco for 19 years. I’m now responsible for all new product development for all of the company’s brands, which include Rebel Yell, Ezra Brooks and Blood Oath. Launching my signature Blood Oath ultra-premium bourbon series. To be able to use my creativity in combining great bourbons and actually putting my name on the bottle. It’s just really something special to me. I would be lying if I said I did, that was way too long ago. But I remember when I first started in this business and sipping on my first sample of bourbon straight from a barrel. It was an unforgettable experience! To me, whisky in particular bourbon means history. Looking back on all the history associated with bourbon in this country, from its roots through all of the great master distillers, it’s just a great honour to be able to be a part of that. To be completely honest, I want to see myself doing exactly what I am doing today. I’ve got the best job in the world! Why would I want to change that? I hope to be able to continue creating great bourbons for a long, long time. My last dram was last night and it was a Rebel Yell 10 Year Old Single Barrel. For a good robust full flavoured well aged bourbon, nothing goes better with it than a perfectly cooked, medium rare ribeye steak. For a dessert pairing, I would encourage anyone to try a nice dark chocolate with that same well aged bourbon. The two are made for each other. After work on the back patio enjoying the nice evening air with a great pour. Really, when I look on the whiskey horizon I just see more and more growth in the bourbon category in the foreseeable future. It’s a great time to be making bourbon. I would have to say Blood Oath Pact 3. The way the three bourbons came together on this one, coupled with the cabernet finish, it’s just something truly exceptional. Many thanks to John Rempe. 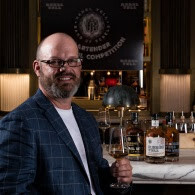 Who will be our next Whisky Insider? Click back soon to find out!